Roridula gorgonias with its beautiful pink flowers and sticky leaves certainly captures the attention of many. Its peculiar relationship with the assassin bug, Pameridia, is definitely one which will spark an interest in any carnivorous plant grower. Roridula gorgonias is a perennial shrub, up to 1 m or more. The simple, narrow, alternate leaves, up to 120 mm long, are crowded at the tips of the branches. 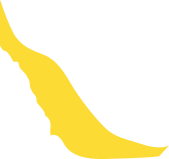 They are covered with sticky hairs, which catch many small insects and occasionally, they trap large insects such as wasps and bees. Roridulas have both male and female reproductive organs. The pink flowers which are 20 mm in diameter, appear from July to October (winter-spring). The seed capsule is not fleshy and once it reaches maturity, the seeds are released. Roridula gorgonias as well as R. dentata are endemic to the Cape Fynbos area in Western Cape. They are not listed as rare and endangered, but due to a small distribution range, the effects of agriculture and too frequent fires, it is likely that they may be added to the Red Data List in the future. 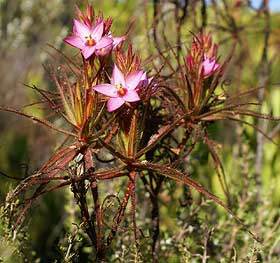 Roridula gorgonias is an endemic and is found in the mountainous areas, at an altitude of 155-915 m, growing in the cooler, damp places, from Somerset West to Swellendam. The genus name Roridula is derived from the Latin word roridus, meaning dewy, since the leaves appear to be covered with fine dewdrops. The species name is thought to be derived from the Greek word gorgon, meaning terrible. In Greek mythology, gorgon refers to the three sisters Stheno, Euryale and the Mortal Medusa who had snakes for hair and if anyone attempted to look at them, would be turned to stone. Roridula is the only genus in the family Roridulaceae, in which R. gorgonias and R. dentata are the only two species. The Roridula plant and the assassin bug, Pameridea roridulae, live in symbiosis. The sticky sap on the leaves of Roridula contains no digestive enzymes. This sap traps insects which are eaten by the assassin bug and in turn; the excretions of the bug are absorbed by the plant through its leaves. The sticky plant serves as a protective home for these assassin bugs, which can move freely over the sticky hairs. The juvenile assassin bugs as well as bees help to pollinate the flowers. For growers all over the world, especially those wanting to add to their carnivorous plant collection, this plant is of much interest. It is used as a pot plant and can be displayed on a window sill or a well-aerated balcony in a sunny position. peat. The seeds must be kept moist but not wet. It will take approximately one month for the seeds to germinate. The seedlings can be pricked out but late germination does occur, so allow more time for the remaining seeds to germinate. When pricking out the seedlings, do not disturb the roots. Pot them into small pots, using the same mix of sand or silica grit and peat. The watering remains the same. 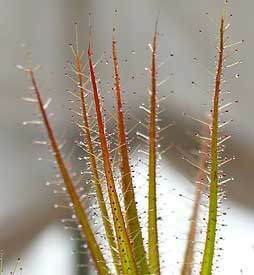 Roridula gorgonias can be propagated by tip or stem cuttings. 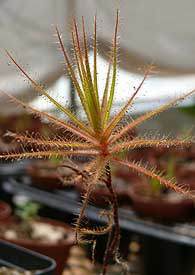 Place the cuttings in a sand or peat medium after having dipped the freshly cut ends of the stems in a rooting hormone. To increase the humidity, cover the tray with a plastic cover. The use of bottom heating increases the rooting percentage. Once the cuttings have rooted and had a week to harden off, pot them into the same mix as used for the seedlings. Place the plants in a sunny, well-aerated area. It is not recommended to use any fertilizers, insecticides or fungicides on these plants since roridulas are very sensitive. If assassin bugs, which help with the feeding of these plants, cannot be found, then try a very weak foliar feed high in nitrogen. Acknowledgements Thanks to Monique McQuillan, horticulturist, Kirstenbosch Botanical Garden, for generously sharing information from her own observations, experience and research. Burman, L. & Bean, A. 1985. Hottentot's Holland to Hermanus. South African Wild Flower Guide 5. Botanical Society of South Africa, Cape Town. Mabberley, D.J. 1987. Mabberley's plant book. A portable dictionary of plants, their classification and uses, edn 3. Cambridge University Press. 1987 is the second edn and the book's title is: The plant-book. A portable dictionary of the vascular plants, so edn 3 (if there is one) must be another year, not 1987. Please check. Trinder Smith, T.H. 2003. 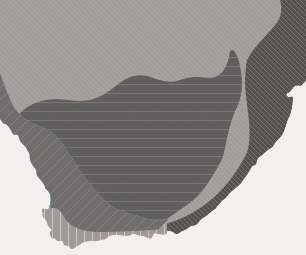 The Levyn's guide to the plant genera of the southwestern Cape. Red Roof Design, Cape Town.